PI: take your pick; TO: when you get tired. The Río Cangrejal is MayanWhiteWater-land's most-rafted and most-kayaked river, and for good reason. (Check out the videos on YouTube.) It contains an impressive number of fun and varied rapids formed by granite boulders and bedrock. It is set in a gorgeous jungly V-shaped valley. It has a long season. And it has easy road access. However, it is not to be taken lightly. It has seen more than its share of carnage (yours truly involved in some of it), and even a few deaths, over the years. There are no mandatory portages, but on most days there are some highly recommended ones. Avoid the undercuts. Another distinguishing characteristic of the river is its ability to rise and fall quickly and substantially. In fact I have not seen another river rise and fall so often, and with an ability to maintain a high flow for many days. This is partly due to the Honduran north coast's heavy rainfall, and partly due to the intact vegetation in the drainage. When the river is up the upper runs are good, though when it's very high most people just stick to the very bottom. The rapids also change greatly with the flow, so no two days are ever the same. Definitely talk to the guides at Omega Tours to get the latest information before you wade in. You could spend a week or two on this river and not get bored. I divide the river into roughly four sections: top, upper, middle, and lower, each of which can be kayaked easily in less than 2 hours at the right flow. The rapids are generally pool-drop, but the short pools won't give you much time to rest. I hesitate to describe the rapids in too much detail since they are constantly changing (including their names), instead I recommend you do what I do and scout liberally each time down. Rafting is popular on the river, though should be attempted only with nimble rafts and experienced guides. Usually rafters stick to the bottom section, though Omega Tours sometimes puts on the top and upper section too. Top (6km, class IV to V depending on flow). This fantastic section goes from the Rio Viejo bridge to the village of El Pital. The rapids here are steep and technical but fun. Shortly below the bridge the Río Yaruca comes in and the bigger rapids start. Their names give a good hint of what's to come: Vegetarian By Choice, Steepness, Extended Play, Slice-n-Dice, Superman, Drop-In-Slide-Out, 180 (or Shithole), Mental Floss, and Fools Drop In. This section can be run at a wide range of water levels, with a lot of scouting required at higher flows. Upper (4km, class IV to V depending on flow). This is another challenging section. You can put on either above or below El Pital with its sequence of 3 big rapids, named El Pital I, El Pital II (or Angel Falls, a river-wide hole), and El Pital III (or Stairway to Heaven). Afterwards the biggest ones are The Wall, Rooster Tail, Barking Dogs, and Las Mangas (a super boulder garden). This section can be run at a wide range of water levels, with a lot of scouting required at higher flows. Middle (2.5km, class V). The Las Mangas bridge divides the whitewater in half. The middle section starts out relatively camly but gets choked up halfway down with house-sized boulders, and is strictly for class V kayakers, with some highly technical and consequential moves through Rainbow, Curtain Call, the infamous Subway, and Omega. Above 1000 cfs I scout and portage more than I paddle. Lower (5.5km, class III to V depending on flow and put-in). The lower section starts just below Omega Tours at a wooden platform and is where the kayaking and rafting action is when the water is lower (and is very full-on when the water is high). There are some nice ledge drops and some big waves, with the bedrock forming some imposing holes, undercuts, and walls in many places. The rapids are close together and the current is swift, especially in the 1st half, and unfortunate swimmers often get taken for a long ride. Named rapids include Ziploc, Hot Chili-Labyrinth, Roller Coaster, Jungle, Los Lobos, Slalom, and Lava. This section gets quite pushy and sticky above 1500 cfs, though can be kayaked much higher. Rafts put on at Jungle with flows much over 2000 cfs, and may take out before Lava due to a dangerous eddy at its bottom. 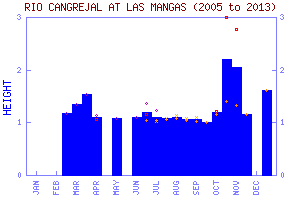 Below the lower section the river continues down to La Ceiba and to the Caribbean Sea in about 1 1/2 hours. Along the way there are some gravel bars and eddies for beginners to practice on, plus surfing at the beach. Flash Flood Danger: normal. The most remote section is the top; put on in the morning. Descent History: First descent is unreported. 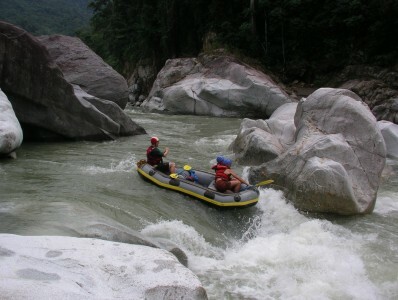 It is run on an almost daily basis by La Ceiba-based rafting companies. Shuttle Notes: Buses on loose schedules ply the river road all the way up to the Río Viejo bridge, passing all the intermediate access points mentioned above. The dirt road along the river suffers from the frequent rains, but most days most cars will make it. This dirt roads begins just east of the "puente Soapin" just outside of La Ceiba, km 193 on the north coast highway. Joining in on Omega Tours' raft trips is an easy shuttle solution. Nearby Tourist Attractions: Bay Islands, Pico Bonito National Park, other coastal wildlife sanctuaries.